View a video of Jessica Riskin discussing the book. Today, a scientific explanation is not meant to ascribe agency to natural phenomena: we would not say a rock falls because it seeks the center of the earth. Even for living things, in the natural sciences and often in the social sciences, the same is true. A modern botanist would not say that plants pursue sunlight. This has not always been the case, nor, perhaps, was it inevitable. Since the seventeenth century, many thinkers have made agency, in various forms, central to science. The Restless Clock examines the history of this principle, banning agency, in the life sciences. It also tells the story of dissenters embracing the opposite idea: that agency is essential to nature. The story begins with the automata of early modern Europe, as models for the new science of living things, and traces questions of science and agency through Descartes, Leibniz, Lamarck, and Darwin, among many others. Mechanist science, Jessica Riskin shows, had an associated theology: the argument from design, which found evidence for a designer in the mechanisms of nature. Rejecting such appeals to a supernatural God, the dissenters sought to naturalize agency rather than outsourcing it to a “divine engineer.” Their model cast living things not as passive but as active, self-making machines. The conflict between passive- and active-mechanist approaches maintains a subterranean life in current science, shaping debates in fields such as evolutionary biology, cognitive science, and artificial intelligence. This history promises not only to inform such debates, but also our sense of the possibilities for what it means to engage in science—and even what it means to be alive. "The Restless Clock is a sweeping survey of the search for answers to the mystery of life. Riskin writes with clarity and wit, and the breadth of her scholarship is breathtaking." "The most influential book of the past twenty years. . . . Interest in the similarities and the differences between human beings and machines goes back many centuries--and Jessica Riskin's The Restless Clock is a rich and resonant telling of that long history. . . . Riskin's sweeping survey isn’t didactic or moralizing, but it contains two vitally important lessons for us: Never bet against human ingenuity in making machines do what people once considered impossible. And never bet against human ingenuity in redefining the uniquely human such that machine-intelligence can never match our own." "At the heart of this scientific and cultural history is the concept of agency—the capacity to act—in nature. Riskin reveals how two distinct interpretations emerged from the mechanical Universe of the Enlightenment: Isaac Newton’s passive version, reliant on a divine tinkerer; and Gottfried Leibniz’s, which saw life as purposeful and 'self-transforming.' Riskin’s investigation of this duality, by way of Renaissance automatons, the gestation of evolutionary theory and quantum mechanics, is engrossing and illuminating." "Wide-ranging, witty, and astonishingly learned." "Riskin uses history as a way of thinking about the world, not just as a way of getting facts about the past right. She shows us the many ways in which scholars have sought to understand those parts of the world that are material, movable and predictable, and those that are characterized by agency, passions, chance, suffering and consciousness, as well as the tricky areas where they overlap. She mobilizes powerful examples from the history of the life sciences of where and how attempts at explaining these areas have succeeded and failed. Her journey takes us everywhere in the best possible way as she probes the limits of our efforts to explain—through science and through history—how the world works inside and outside the realm of our agency, purposes and reasoning." "Riskin’s book begins with Descartes and automata and traces the development of ideas about what animates living things up to the present. Science long ago moved away from theories about a divine clockmaker, but Riskin says some of the ideas from that period persist in surprising form. In particular, she says, atheist philosophers and scientists who regard consciousness in purely mechanistic terms, are inadvertently borrowing a schematic that, in a different time, struck people as evidence of God." "Riskin has written a lengthy, detailed, impressive monograph based on her concern over a vital paradox of science. The author begins by discussing the argument that some scientific ideas commenced with a model of nature as a clock, which God designed and produced. This argument appeared to be supported by clever automata, which medieval mechanics had developed in Christian churches. Soon there were objections to that model, and skeptics seemed to triumph with Darwin’s theory of evolution by natural selection in The Origin of Species (1859). However, there are philosophers of science who still argue that Darwin’s theory is an incomplete understanding of nature, and Riskin takes this claim very seriously. Highly recommended." machines and machine metaphors in the life sciences." "Recuperating the tradition of active mechanism—the vision of an animated yet material universe—Riskin demonstrates what a powerful challenge it poses to contemporary modes of thought that claim the authority of science. Ultimately, The Restless Clock offers nothing less than an alternative way of seeing the natural world, and being in it." "The Restless Clock unravels the history of thinking about agency in the history of modern science so as to determine how mechanism and passivity became the dominant paradigm. In this expansive work—which draws on primary sources, correspondences between intellectual radicals, and archival materials from across the Western world—Riskin expertly demonstrates not only how the principle of passivity came to dominate modern science in the first place but also how this principle has influenced contemporary science. In taking on the problem of agency as supposedly banished from modern science, she compels us to think about how agency is actually essential in and to nature. Riskin captivatingly tells the story of this “centuries-long argument” over agency with the patience, precision, and the profound depth of explanation that history demands. The Restless Clock provides a much-needed investigation of how scientific understandings of material reality have been undergirded by historical understandings and calls for more deliberate historical analysis not only in scientific work, but also in critical analyses of scientific discourse and ideology. Such a work deepens our comprehension and awareness of the taken-for-granted ideologies that underpin modern science and, subsequently, the contemporary challenges posed to it by movements such as new materialisms. The Restless Clock will become a frequent reference for anyone interested in the matter of matter." "This timeless fascination with the question of what it means to be living has been explored most recently be Riskin, a history professor at Stanford University. In her latest book, The Restless Clock, she moves past the previous theologically and philosophically grounded discussions and looks at these questions of autonomy through the lens of a historian....By putting forth these questions in the words of past intellectuals, Riskin engages the reader in evaluating these existential questions with respect to big-picture “processes” like evolution, artificial intelligence and epistemology." "Astonishing. The Restless Clock...has seriously altered my understanding of the last five hundred years of intellectual and cultural history, and has significantly intensified my belief that the only truly theological account of modernity is one deeply immersed in the technological history of this past half-millennium." "In this impressive cultural and intellectual narrative of the sciences of life and the techniques of mechanics, Riskin shows decisively how a richer and broader history of such sciences offers indispensable lessons for controversies surrounding agency and purpose in our understanding of the world. The Restless Clock explores fascinating projects launched by medieval churchmen and Renaissance artisans, enlightened philosophers and modern experimenters. It documents the construction of automata and experimentation in biology, the ambitions of Darwinism and of germ theory, the visions of cybernetics and of neurosciences. These stories reveal the power and importance of a tradition of living machines within the development of western sciences that has been strangely underestimated or dismissed. Its legacies today need just this kind of astute re-evaluation. This book will become a central reference for many vital debates about the long history of life sciences and the possible futures of intelligent machines." 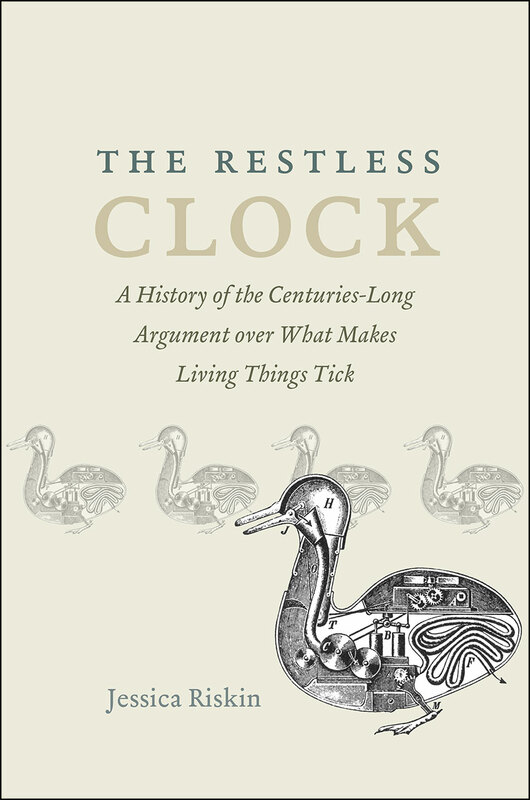 "The Restless Clock examines more than four centuries of debate over the extent to which living beings can be understood as governed by 'mechanism,' and in the process it reorients our understanding of some of the most important themes and individuals in the Western canon during this period, including the thought of Descartes, Leibniz, Kant, Lamarck, and Darwin, plus contemporaries such as Dennett, Dawkins, and Gould, among others. Riskin has written a work of tremendous intellectual scope and accomplishment." "In this original and masterful book, Riskin recounts how scientists, philosophers, artists, and mechanics have wrestled with the nature of vital entities on the page and canvas, in the workshop and in stone. Here among others are Vaucanson and Kant, Descartes, Leibniz, and Darwin, defecating ducks, talking heads, and robots—giving us both the unfamiliar and the familiar in a new light, presented with deft analysis in luminous prose." "In The Restless Clock, Jessica Riskin brings a fresh view to the historical discourse around the use of mechanical metaphors in biological thought. Using agency as her theoretical starting point, Riskin traces a line through the last six centuries of biological thought with thorough evidence and analysis." "Modern biology is essentially flawed. This is the stark message that underlies the whole of Jessica Riskin’s intricately detailed, meticulously researched, and astonishingly wide-ranging book. . . . Thought-provoking and utterly engrossing." "Among the many virtues of Riskin’s book, perhaps the greatest is its tremendous scope, and its author’s remarkable ability to handle all the periods, figures, and issues in it with equal mastery." "The Restless Clock is a work of high scholarly order. Considering its chronological and thematic embrace, this study makes for a challenging scholarly undertaking. The result is both impressive and rewarding. This book is the combined product of Riskin’s penchant for meticulous research as well as her judicious choices and penetrating readings of sources. She uncovers a rich and compelling story that should interest all historians and philosophers of science as well as scientists." "There is an inherent contradiction at the heart of modern science since its inception, and [The Restless Clock] tells this story beautifully. The exclusion of 'agency' from scientific explanations has paradoxically rendered the appeal to a 'divine engineer' necessary; Riskin argues in this compelling and wide-ranging account of the history of mechanism in biological thought. . . . nothing short of a historical 'tour de force' that sheds new light on the history of mechanism and on the rise of the modern scientific worldview. Thanks to its historical breadth and depth of analysis, Riskin's ambitious book will continue to invigorate scholarship in the field of history of (life) science for decades."